A major law firm has launched an LGBT+ network to advise the community about legal issues through the different stages of their lives. The network was launched at Hodge Jones & Allen’s offices in Euston, North London, with a panel about transgender experiences in the workplace. The event was an example of how the network aims to tackle the unique issues faced by LGBT+ individuals. 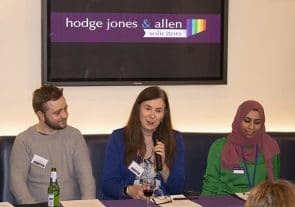 The panel discussion highlighted the issues facing trans individuals at work and featured Emma Cusdin, People Director at Aviva and Director at Global Butterflies; Homa Wilson, employment partner at Hodge Jones & Allen and Luke Williams, trans lawyer and lecturer at BPP University Law School. The Network at Hodge Jones & Allen aims to advise on LGBT legal issues and to highlight the firm as LGBT+ friendly. The evening, which was attended by around 70 people was not only aimed at people who are part of the LGBT+ community, but those who wanted to show support and gain a greater understanding of the issues that trans and LGBT+ people face. Joshua Ryan, a trainee lawyer in the firm’s Wills and Probate Department said: “We are an LGBT+ friendly firm and we wanted to set up a forum where the issues that the community faces could be discussed. Remyhs Baker, a specialist family lawyer at Hodge Jones & Allen, said: “It can be daunting for members of the LGBT+ community to know where to go for legal advice. Clients have to talk about their personal lives and should not feel worried about the prospect of being judged. The LGBT+ Network will run a number of events in the future which are free and open to the public.